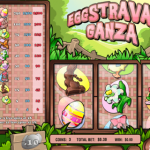 Eggstrava-Ganza is a 3 reel 1 payline slot game released in 2009 by Rival. If you figured it out from the name the theme here is Easter! And what do we have in Easter? well of course Easter eggs! 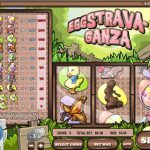 This is not very common for 3 reel slot games but there’s a scatter here and it is the Easter Bunny symbol. When you land 1 or 2 bunnies you will earn 5 or 10 Free Spins respectively. Also, all your wins during the Free Spins round will come with a 3x multiplier. 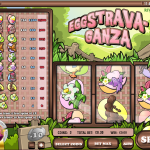 Eggstrava-Ganza is a basic 3 reels slot game but we like it more than others. We think that the free spins option really makes it unique so that’s a cool bonus. Give it a go! If you’re a fan of Arabian Nights themed slots then maybe you should consider playing Crazy Camel a 3 reel slot by Rival.